Worthington High School Students is a picture, with genre photograph. Its dimensions are 4.9 in x 3.4 in.. It was created on Friday, September 6, 1940. Padi (Goerke) Miller is the Creator. This photograph is from the "Senior Memories" diary of former Worthington High School Student Padi Goerke. 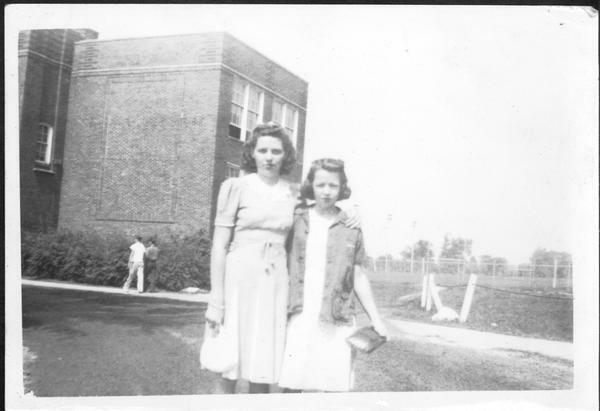 The picture was taken with several others on the grounds of the old Worthington High School on Granville Rd., known as the Packard Annex. The following caption accompanied the photograph; "Friday Sept. 6, 1940 Marilyn Bath, Margie White woo! woo!" It covers the topics Packard Annex, buildings and students. The Worthington Memory identification code is wcd0028_002. This metadata record was human prepared by Worthington Libraries on April 15, 2004. It was last updated October 20, 2017.